In an electric mixer, cream the butter and cream cheese. Blend in flour and salt and mix until well combined. Turn the dough out onto a floured work surface and gather into a ball. Divide into 14 equal portions. Place each portion on a piece of plastic wrap, roll into a small ball, flatten slightly into a disk, wrap and refrigerate for at least 3 hours or overnight. When you are ready to make the cookies, make the filling by stirring together chopped nuts, sugar, and cinnamon in a small bowl. Preheat an oven to 350°F. Line 2 baking sheets with parchment paper or silpats. Lightly flour a work surface. Remove 1 disk of dough from the refrigerator. Gently pound each disk with a rolling pin until the dough softens slightly, and then roll into a 6-inch circle. Sprinkle with about 1 tablespoon of filling. Using a large knife or pizza cutter, cut the dough into 6 wedges. Starting at the wide outside edge, fold in the two corners of each wedge toward the center, and then gently roll it up toward the point. As each cookie is formed, place it at least 1 inch apart on one of the prepared baking sheets, bending the ends of the dough toward the center to form a crescent shape. Repeat with the remaining dough and filling, flouring the work surface as needed. Bake the rugelach until golden brown, about 12 minutes. Transfer the baking sheets to wire racks and let cool for 5 minutes, then transfer the rugelach to the racks to cool completely. 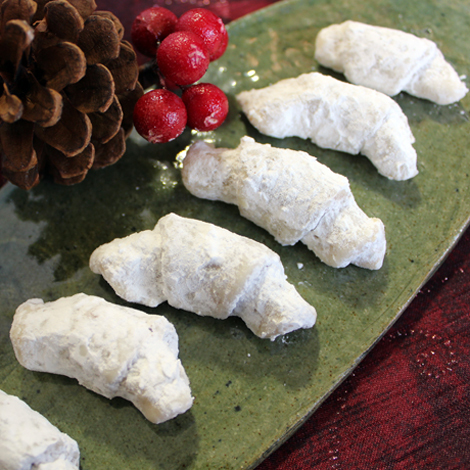 When cookies are cool, roll them in powdered sugar until covered completely.